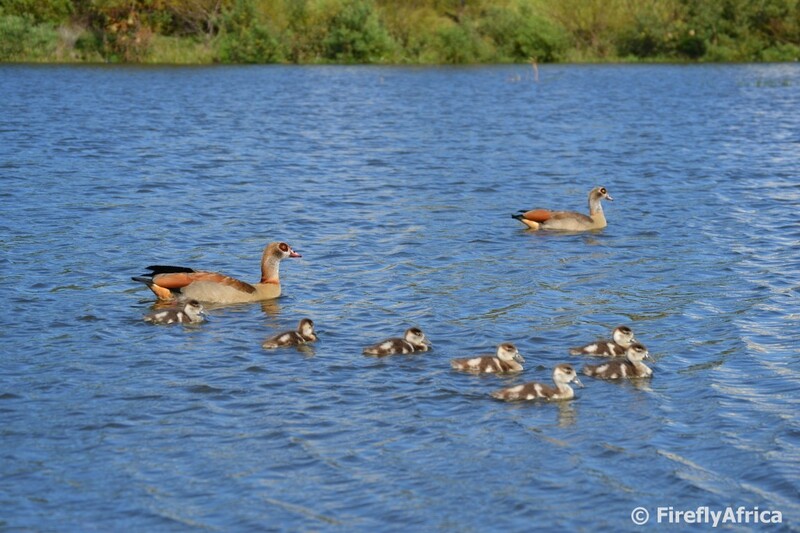 Where ever there is a dam, lake or other piece of water you are sure to find a family of Egyptian Geese. 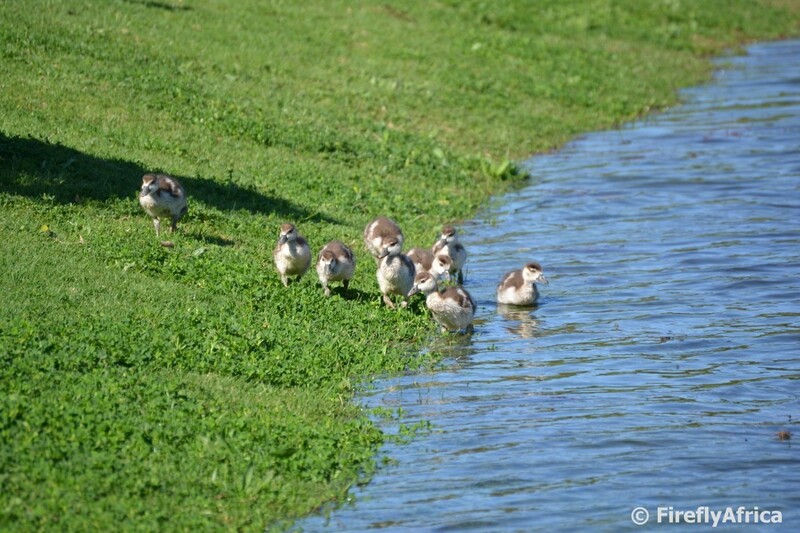 Last weekend during our CITO clean up at Lovemore Lake in Mount Pleasant the resident Egyptian Geese couple came to show us their babies, swimming past quite close. In the Geocaching world the word CITO stands for Cache In, Trash Out. 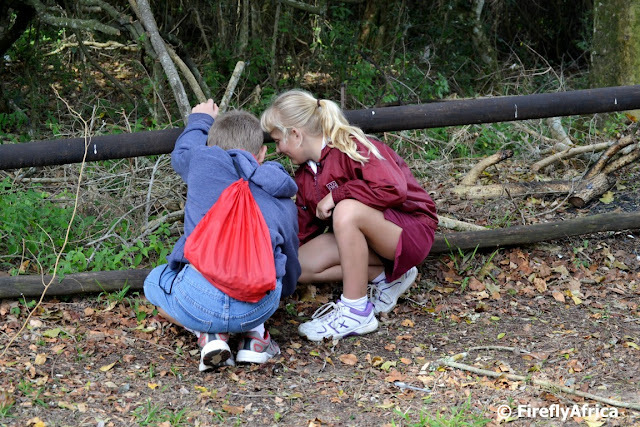 A CITO is a Geocaching event where cachers get together to clean up an identified spot at or near a Geocache location. 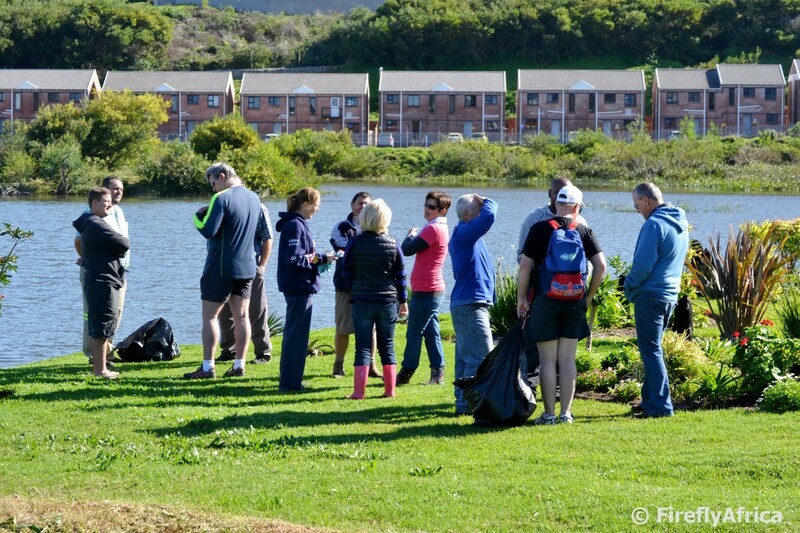 Last Saturday the PE cachers got together to clean up the area around Lovemore Lake in Mount Pleasant. This is such a beautiful spot and it's hard to believe that people would mess up such a place. 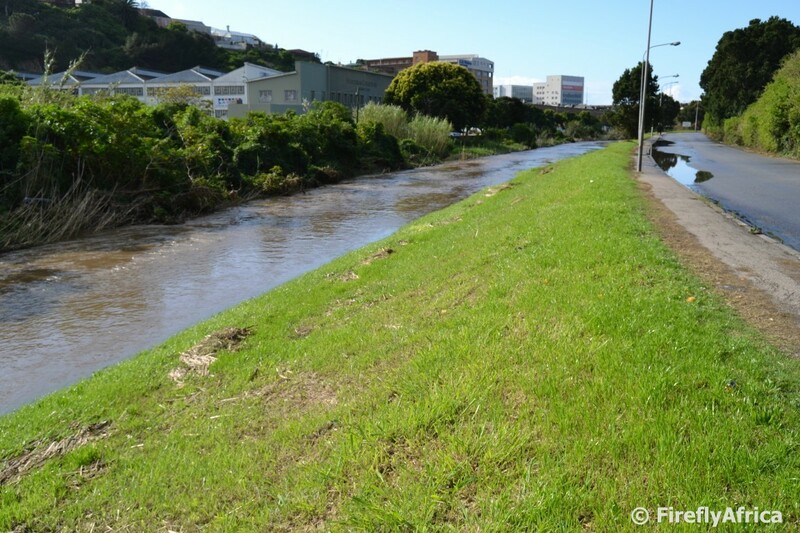 Luckily it wasn't too dirty but still, it makes me wonder how the people living around the dam can allow it to happen. I am currently at the Getaway Show in Johannesburg working off the Kouga Baviaans Surf and Safari stand. The stand across from us belongs to the Sarah Baartman District Municipality (formerly the Cacadu District Municipality) promoting they "7 Wonders of our World". 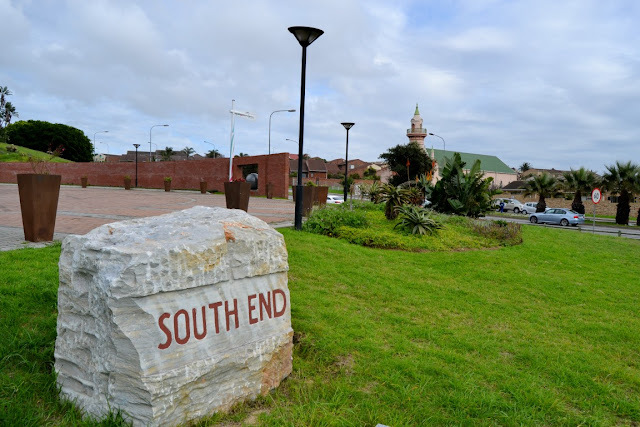 The Sarah Baartman DM is located on the western side of the Eastern Cape and surrounds the Nelson Mandela Bay Municipality which includes Port Elizabeth. 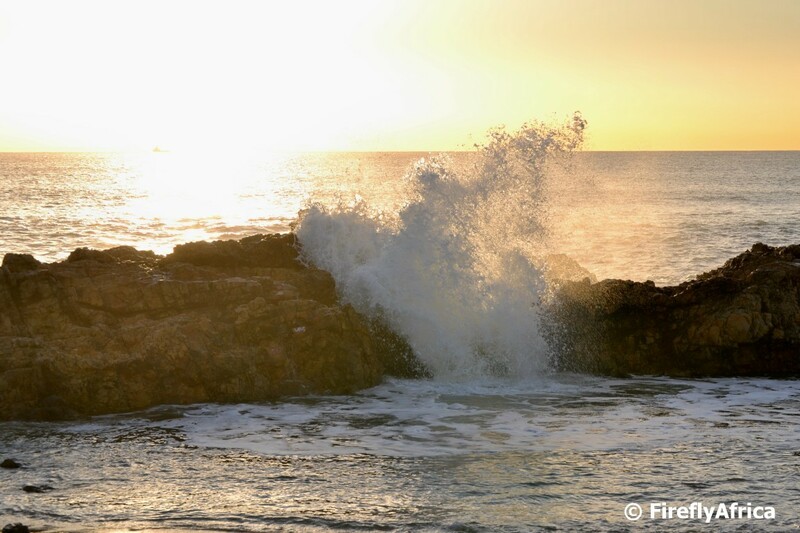 The 7 Wonders they are promoting are the 7 areas that make up the DM namely Tsitsikamma, Kouga, Baviaans, Addo, Karoo, Sunshine Coast and the Frontier Country. I decided to post the 7 Wonders promotional video as for this week's Video Friday. Hope it puts you in the mood to travel this weekend. At the one end of the Kings Beach Park's lake is an elevated area from where water cascades down into the lake. This elevated area have been here as long as I remember. Long before the redevelopment took place. When I was small there was a kiddies waterslide and small pool where we often went to swim. I remember the day so well when we were big enough to leave the kiddies slide behind and go to McArthur Pool's slides for the first time. That was many many moons ago. The Voting Line must surely be my favorite art piece along Route 67. I just can't get enough of looking at the figures and every time I'm there it feels like I'm noticing a different feature. We've had a fair amount of rain over the last couple of months... Ok, so maybe a bit more than a fair amount of rain. So much in fact that my backyard has become a swamp with water oozing up between my toes if I walk there barefoot. 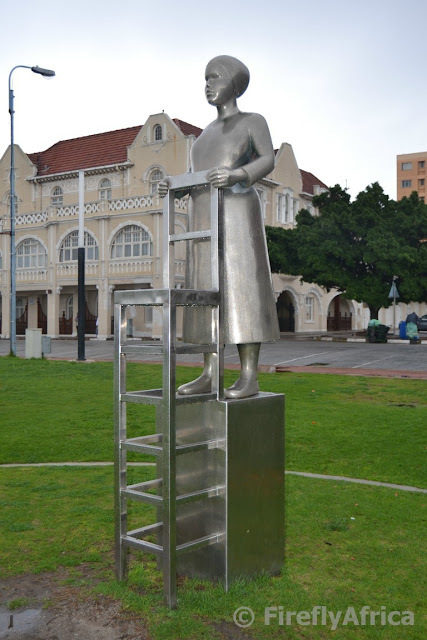 Last Thursday night and Friday morning it came down in buckets again with me spending part of the morning standing in that rain on the Donkin Reserve as part of an Amazing Race I organized for Skal. After the Skal lunch at Colonial Kitchen I headed back to the office and snapped this pic of the lower Baakens River flowing nice and full. Normally people would go to a game reserve to see giraffes but did you know there is a group of 20 giraffes on the Port Elizabeth beachfront? What do you call a group or collection of giraffes? While we are at it. I bet you didn't know that there are a couple of American states that has laws involving giraffes. 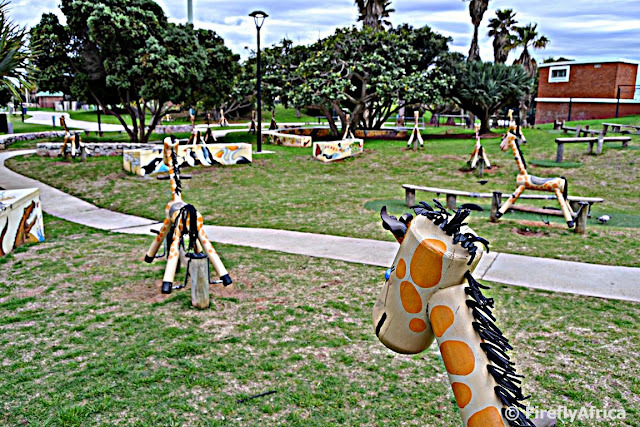 In Atlanta, Georgia, it is illegal to tie a giraffe to a lamp post or a telephone pole. In Chicago, it is illegal to fish while sitting on a giraffe’s neck. In Idaho, you can’t fish while sitting on a giraffe’s back. Most people know South End as the area in Port Elizabeth just above the harbour where the main fire station, Humewood Police Station, South End Cemetery and lots of townhouses is. 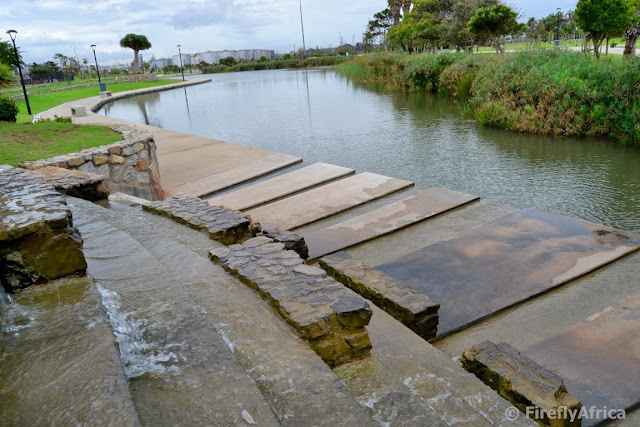 A lot of younger residence of Port Elizabeth probably don't know the history of the area. All of this was crushed when the National Party was elected to power in 1948. This was the start of the implementation of a set of laws that led to what we know as Apartheid. One of these laws was the Group Areas Act which required that all non-whites be removed from what was identified as “white only” suburbs. These removal was carried out by force. 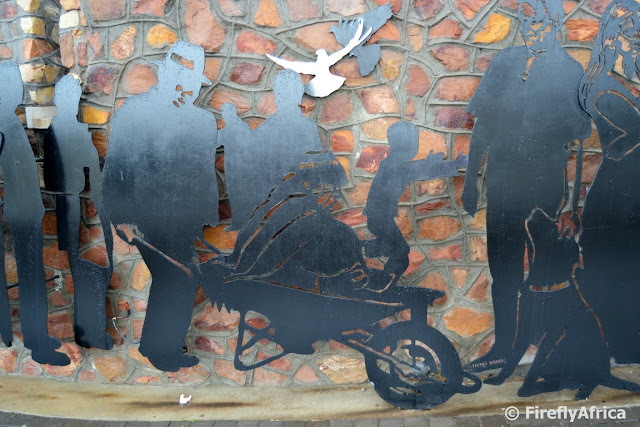 The coloured residents were moved to areas such as Gelvandale, Korsten, and Chetty, the Chinese people to Kabega Park, Indians to Malabar and black people to townships such as New Brighton. This meant that people had to travel long distances to get to work, school and even church and hospitals. The buildings that these people lived and worked in were destroyed through the bank with only a few left behind. Somewhere in the early 80's if I remember correct, they started building townhouses and that is what most of South End is made up of these days. Most of the art making up Route 67 is located around the Donkin Reserve and the city centre. There are a couple of installations making up the 67 art pieces of the route that aren't located on the direct walking route though. One of these is the South End glass sculpture on the island in the parking area next to the South End Museum. The sculpture commemorates the families that were forcefully removed from the old South End under the Group Areas Act. 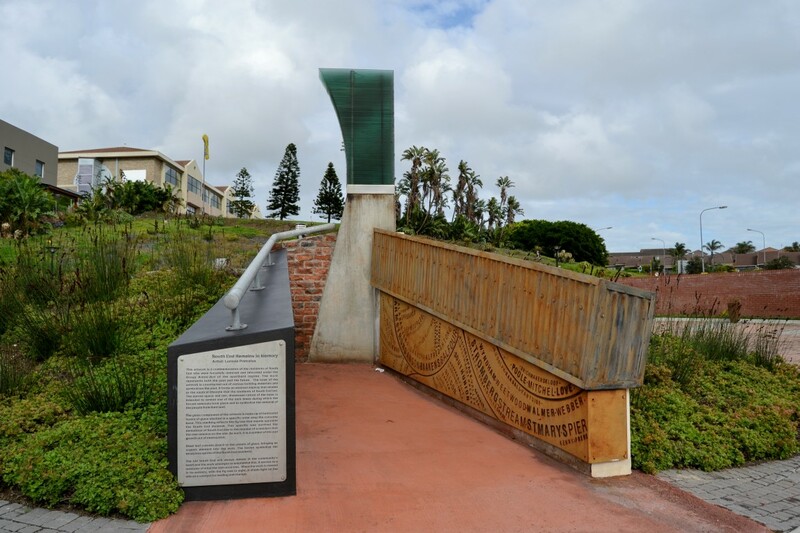 The glass sculpture itself represents the old fig tree across Beach Road which survived the surrounding demolishen. The big cats from the Eastern Cape and surrounding areas just don't want to be contained. First a couple of cheetahs suddenly appeared in Addo from who knows where, Then a lion escaped from the Karoo National Park and roamed the surrounding countryside for a couple of weeks before being captured. Well, things happen in threes. Nomad, one of the Addo males, has answered the call from a female lion in neighboring Schotia Safaris Private Game Reserve and decided to go and check her out. He was darted by Schotia and escape the holding area before being darted again and being returned to Addo. Watch this SABC news bulletin about the escapee's big adventure. I sometimes ask myself, "Self, how many people every wonder about the history of an old building when they drive past it?" I snapped a picture of St Philips Church in Richmond Hill yesterday and decided to go and see if I can find any information about the church's history and background. Guess what? I'm going to share what I found with you. 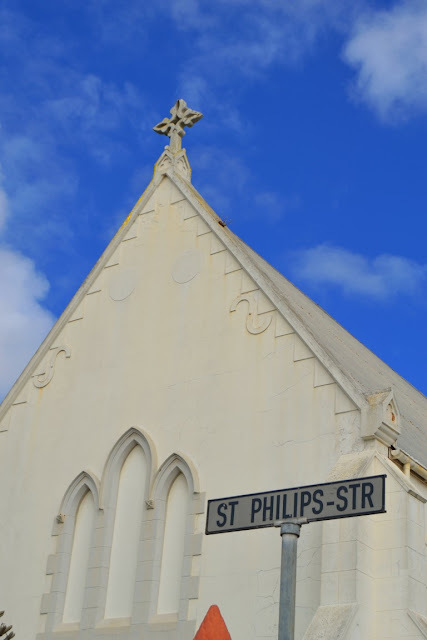 St Philip started as a mission church way back in about 1872 with families, mostly Dutch speaking, who had moved to Port Elizabeth from what is now the Western Cape. 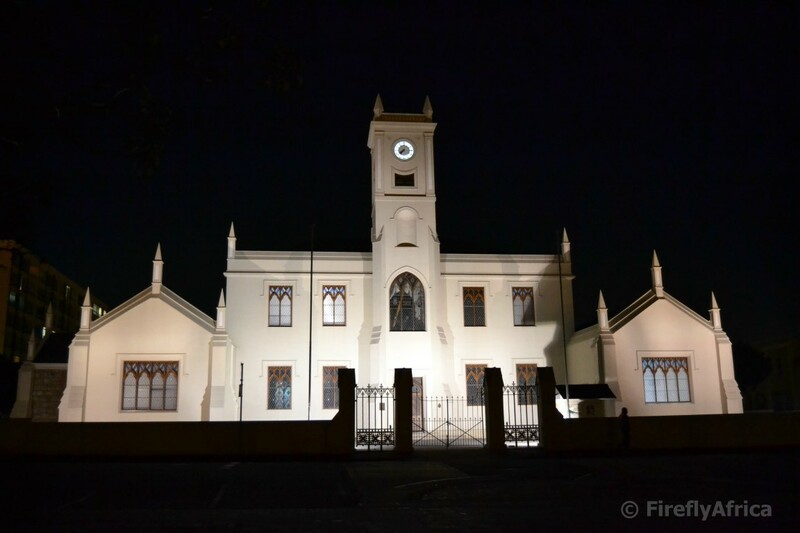 The church started in a wool store in Strand Street before moving to the Mechanic's Institute in Donkin Street before a lack of space took them to the then St Paul's Boys' Schoolroom. Here they became the responsibility of the Rector of St Paul's with the ministry starting to prosper under a Mr PR Mollett, a teacher, who later became St Philip's first Rector. An application for land from the Municipal Council was made which was granted under a special Deed of Transfer dated 1883. This deed vested the property under three Trustees, one of whom was the Mayor of Port Elizabeth and the other two elected by the congregants. 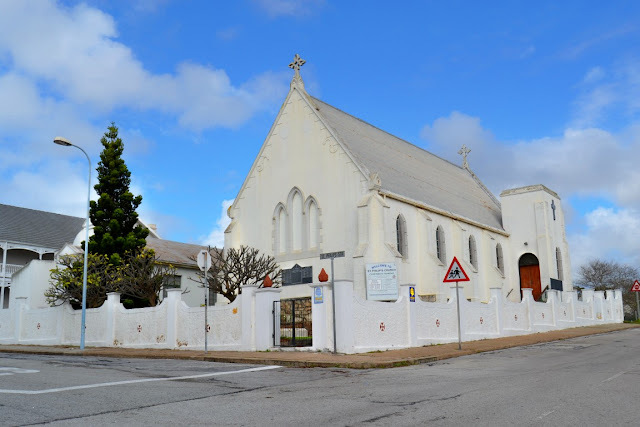 The foundation stone of the present church was laid in May 1883 with the church being dedicated in 1884. The church has seen many ups and downs, losing numerous parishioners to other parishes when the Group Areas forced removal of families from Central and South End. The Diocesan authorities expressed the view that the church's closing was inevitable and the last Rector was appointed in 1960. But guess what? The church still stands today and still continues doing it's work. The St Philips Anglican Church in St Philips Street, Richmond Hill use to feature quite often on PE Daily Photo after Sue and Max started it as they stay just up the road from it. I don't get to Richmond Hill that often but had to stop at the church to *cough* look for a Geocache today. I just had to take a pic or two. I'll post the other one tomorrow. I met a friend and colleague for coffee at South Boulevard Café at the South End Museum the other day. 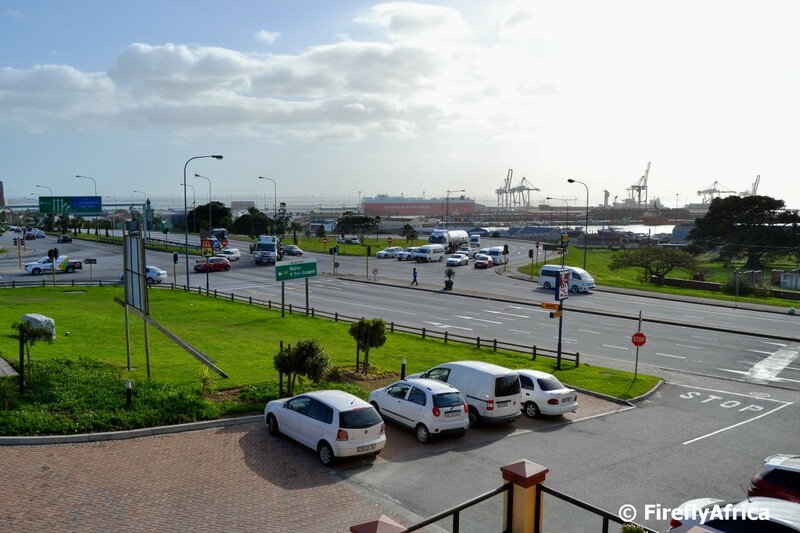 The museum is situated at the intersection of Beach Road, Walmer Boulevard and the Settlers Freeway. The coffee shop has seating both inside and out on their first floor verandah which gives one a view of the intersection and harbor beyond. To some people this wouldn't be the best view around yet I actually enjoyed watching life go by while enjoying a cup of coffee. Its like people watching in a shopping centre. Oh and did I mention that their food is very delicious and the prices not bad at all? No? Well now I have. Whenever there is a big cold front approaching the fishing boats fishing off Algoa Bay sails into the bay to seek shelter against the storm. 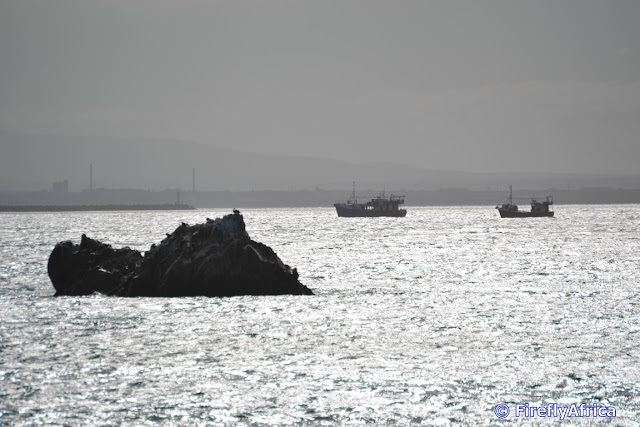 They normally anchor just offshore and wait out the storm before heading back out to continue fishing. So apparently marbles is the in thing again at the KidZ' school. Sheez, I remember how we played marbles when I was still in primary school. Amazing how fads like this come and go. Yesterday while attending the International Geocaching Day event at The Island the KidZ got bored with the rest of us and decided to play some marbles. Check out Chaos Boy's bag full on his back. Today is International Geocaching Day and I joined my fellow Geocachers in celebrating it with an event at The Island Nature Reserve near Seaview. 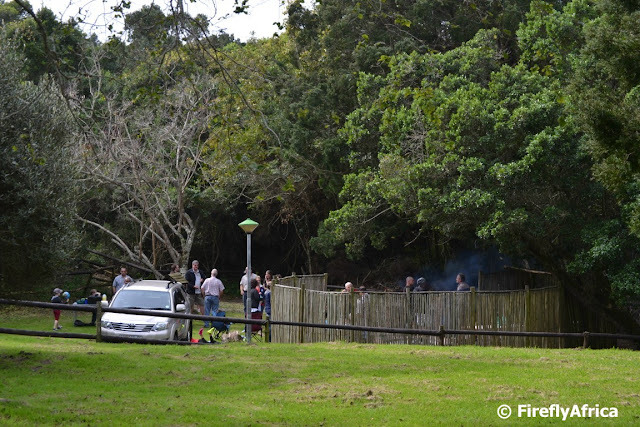 The Island is the perfect spot for a picnic or braai with a safe environment, lots of shade and lush grass. We took up the lapa area while there was a kiddies party with a jumping castle on the other end of the picnic area. We didn't even know they were there. Although you normally associate The Island with the hiking trails through the reserve, you don't really have to go there and hike to enjoy it. I was looking for something to post for this week's Video Friday and found this "Winter in Nelson Mandela Bay is Hot" clip which Nelson Mandela Bay Tourism did a couple of years ago. 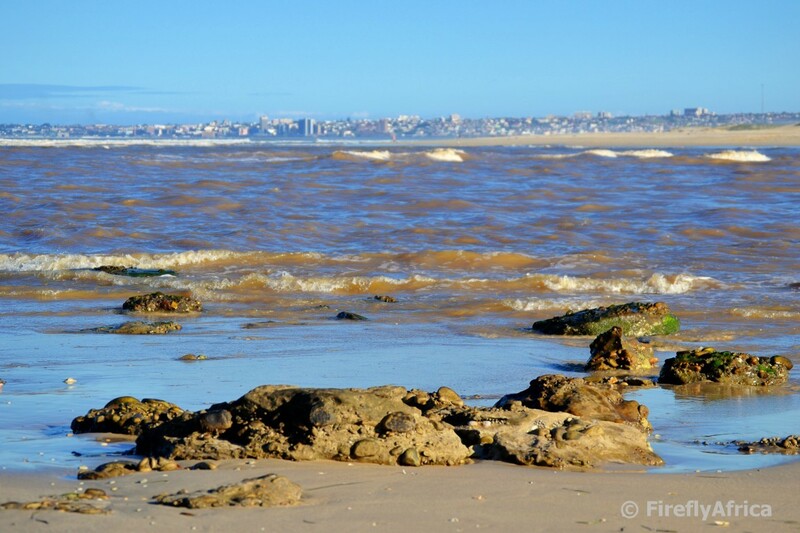 Seeing that today was one of those perfect winter days we get in PE I decided that the clip is nogal appropriate. Last Sunday there was a cold wind blowing and it really wasn't beach weather. Saturday afternoon already the Damselfly said that she wanted to go for a walk on the beach Sunday so come the day she wasn't going to allow the weather to put her off. The walk was very short though but I still took the opportunity to snap a pic or two. 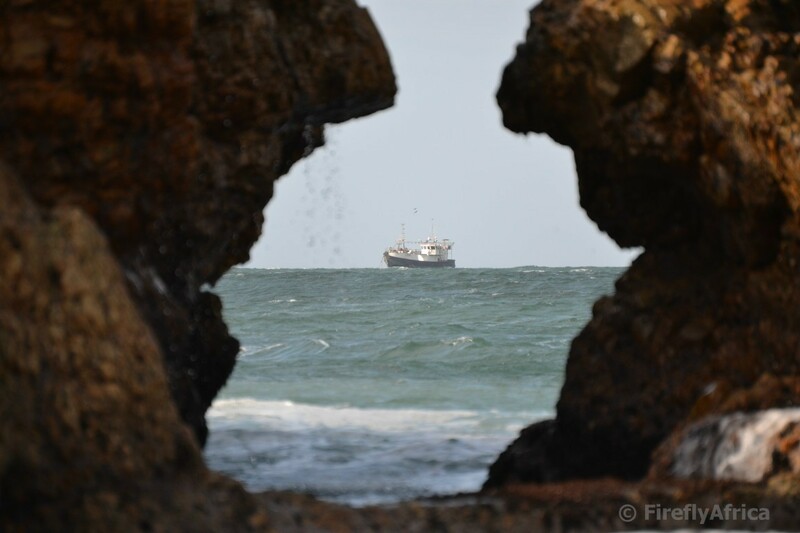 One of those was this one of a fishing boat at anchor in the bay to shelter from the storm framed by the gap between the rocks in front of Something Good. The Swartkops Estuary is one of the best bird watching spots around Port Elizabeth. 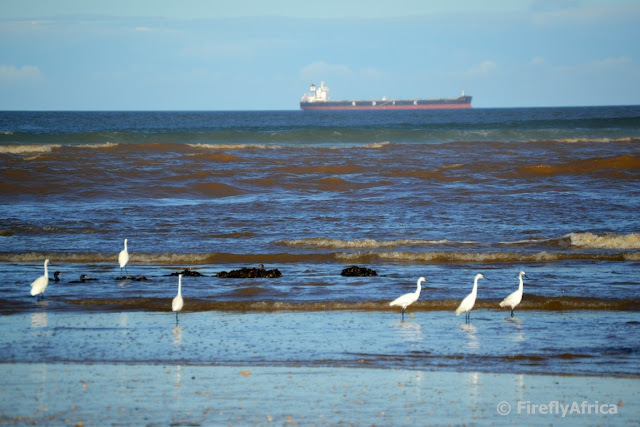 Making a quick stop at the river mouth a week or so ago I noticed that you can watch birds right up to the river mouth. 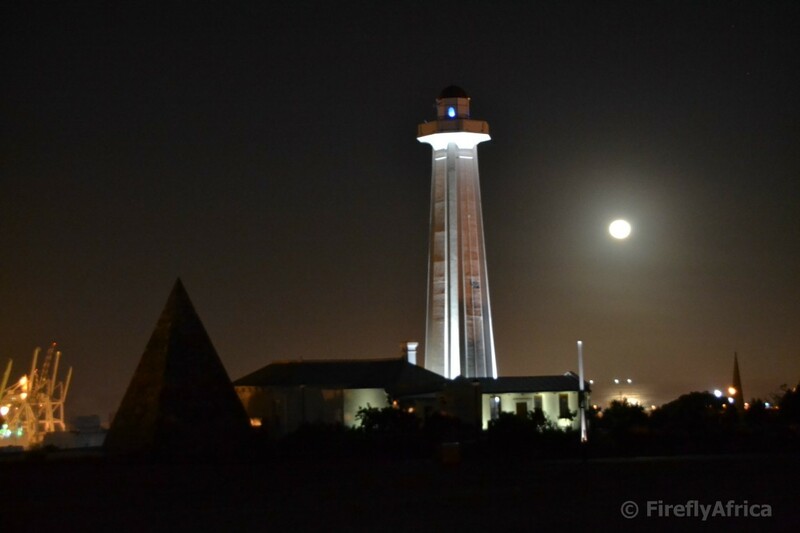 When was the last time you've passed by the Donkin Reserve after dark. Well I did last week and snapped this pic of the Grey Institute. For those who don't know the history of the building, here it is. In the mid 1800's there was a boom happening in Port Elizabeth. It was during this time that Sir George Grey, Governor of the Cape from 1854-61, played a leading role in the establishment of educational institutes throughout the colony. At the instigation of John Paterson, one of Port Elizabeth's first Town Councillors, the then municipality took over vacant land on top of the hill opposite the Donkin Reserve and established a grammar school. A Mr Archibald was commissioned to prepare plans and specifications for the building in September 1856 and by the end of 1858 the school was ready for occupation. The town decided to name the school in honor of the Governor, in recognition of his contribution to education in the colony. In January 1859 elementary classes were commenced and in April the high school was formally opened. When the building was built it didn't have a clock tower. This was added in 1875 and gave the building its dominant character over its surroundings. By 1914 the building had grown too small for its needs, and the high school was moved to its current location in Mill Park. After that the building was used by Pearson High School (now in Summerstrand) and Albert Jackson Primary School (which later moved and became Greenwood Primary on Park Drive). 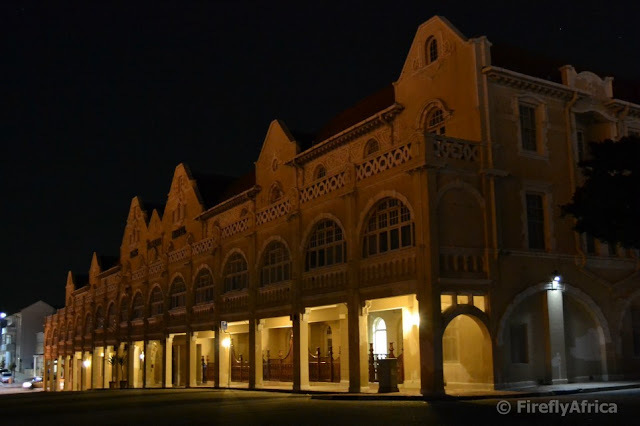 The building was declared a National Monument on 10 December 1976. The Grey Institute building started to fall into disrepair and wasn't looking very good when it was bought by the Mediterranean Shipping Company for their Port Elizabeth office. Over the last decade or so they have pushed millions of rand into the restoration of the buildings with a full time restoration team and the place is looking stunning inside and out. Well worth a visit if you can twist somebody's arm to show you around." The Damselfly is busy getting ideas for their office Christmas lunch at the end of the year so we went to try out Blackbeard's Restaurant at the Chapman Hotel as part of her research. 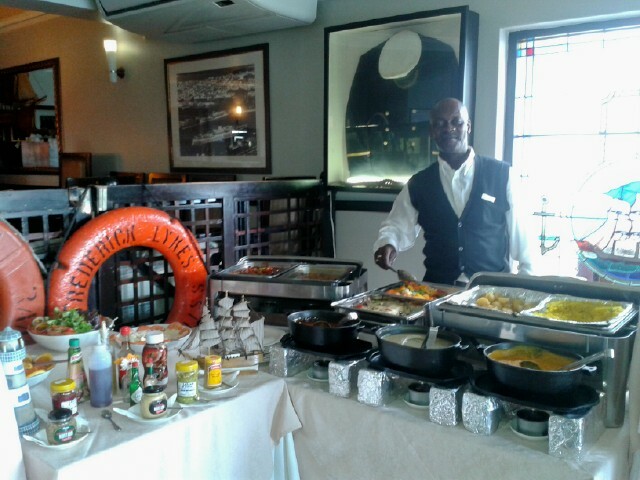 At R120 per adult and R75 for a child it must be one of the more affordable Sunday buffets around. The starters were a choice of three different soups - butternut, sweet potato mushroom and a tomato based soup. The main was a choice (or some of everything) of chicken is a sweet sauce, fish bake or beef stew with yellow rice, fried potato, vegetables and three salads. Dessert was fruit skewers, Malva pudding with custard and chocolate mousse. It was so totally worth it. Oh and I won't be having dinner cause I'm stull stuffed. 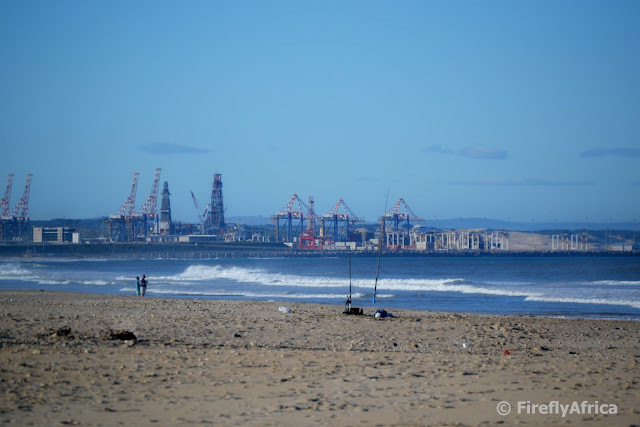 Coega Harbour seen from Bluewater Bay Beach. Notice the two oil rigs currently being worked on in the harbour. 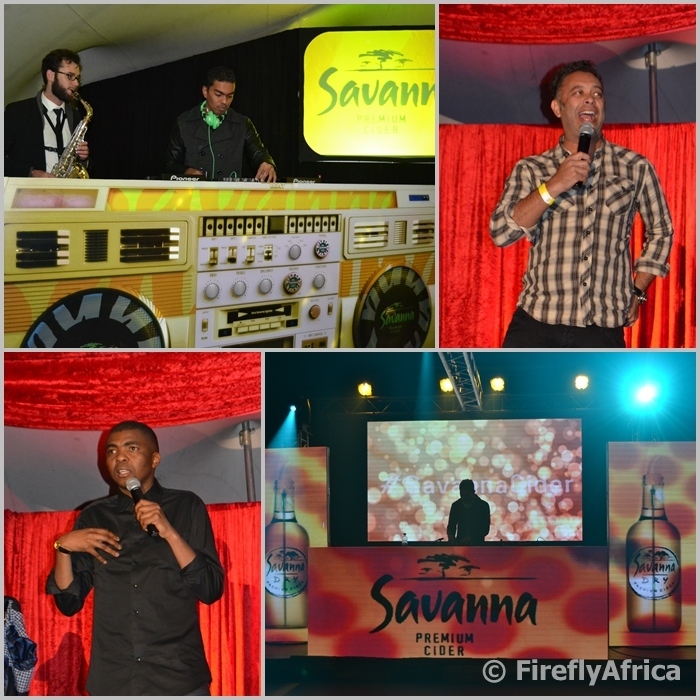 A couple of weeks ago I received an invitation to the Savanna Before and After Party here in Port Elizabeth. I'm not really the party and nightlife type so would probably have looked at the invite with only half an eye if it wasn't for the fact that it was a Savanna Party. 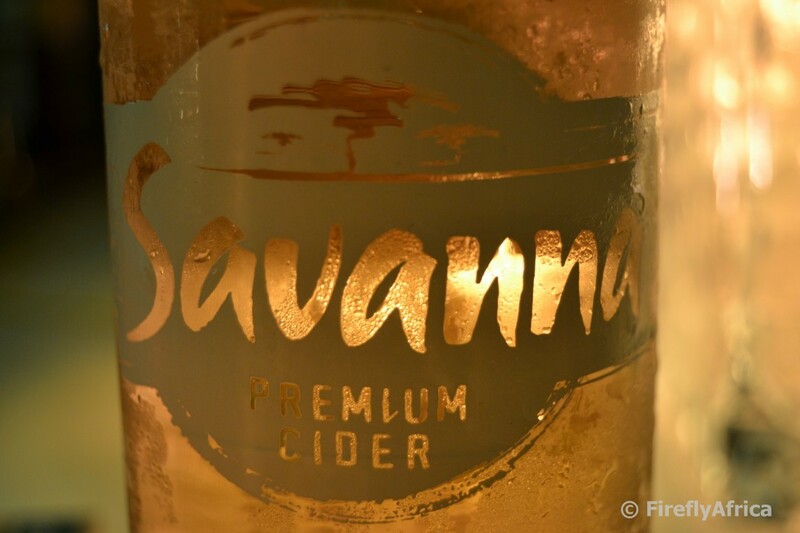 Savanna Premium Cider is my favorite drink after all so how can I miss it? Saturday evening we dropped the KidZ off at the In-Laws and off we went for a night of the town with Savanna. The event took place at the Rooftop Garden Bar in Chapel Street and all the attendees were welcomed by the yellow carpet and some seriously serious looking security dudes. No party crasher is going to get in this door. The theme was clearly yellow - duh! - and the venue was beautifully decorated accordingly. The reason for the party. 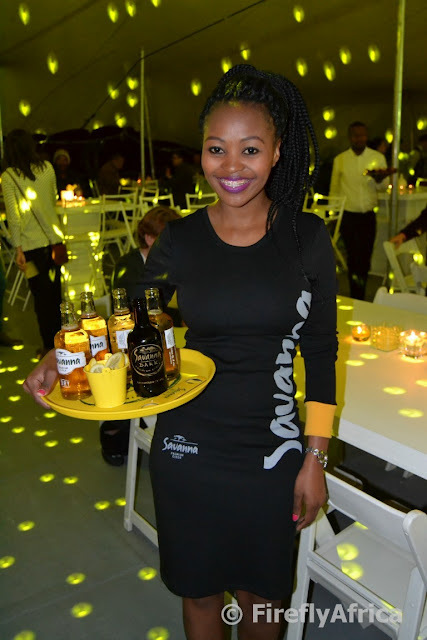 Savanna launching the new packaging for their bottles. This includes a new bold crown design; a longer and slimmer neck; "for the ultimate drinking experience; a bottle with stronger, more "manly shoulders"; a slick new label and debossing on the side of the new Savanna bottle to lend more personality and add more "grippability". Savanna lovers don't have to worry that the taste would perhaps change though because it's "New on the outside, still dry on the inside." That's my advertising spiel done. 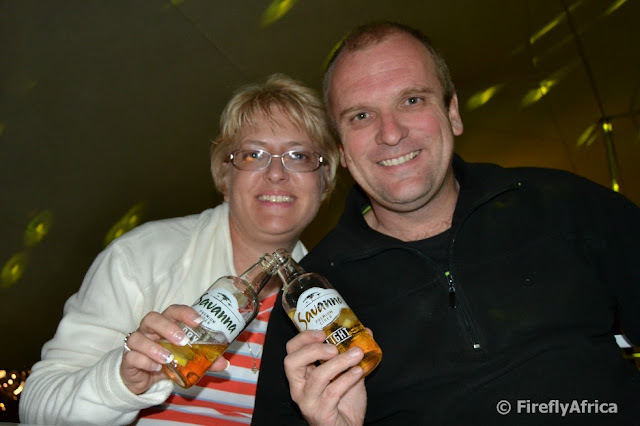 As could be expected, there was no shortage of Savanna and the waitrons made sure nobody sat with an empty bottle in front of them. I can't say that I have a favorite but as I'm not a heavy drinker I try and stick to Savanna Light which kept my head clear the whole evening. It did help that there were a lot of snacks making the rounds as well just to make sure the tummy is lined as the Savanna makes it's way down. Entertainment was at the order of the evening with a DJ and sax player keeping the tunes going until the fun started. The MC for the night was South Africa's wackiest boykie, Kurt Schoonraad. Oh man, I laughed so much the tears were running down my cheeks. I'm sure there were one or two in the audience who nearly wet themselves when he, who comes from the Cape Flats himself, did he's absolute best Cape Coloured impression. As if it wasn't enough, Kurt was followed on stage by one of South Africa's most popular standup comedians, Loyiso Gola. I can't remember when last I have laughed as I did on the night. After the comedy entertainment it was time for the party to move downstairs. 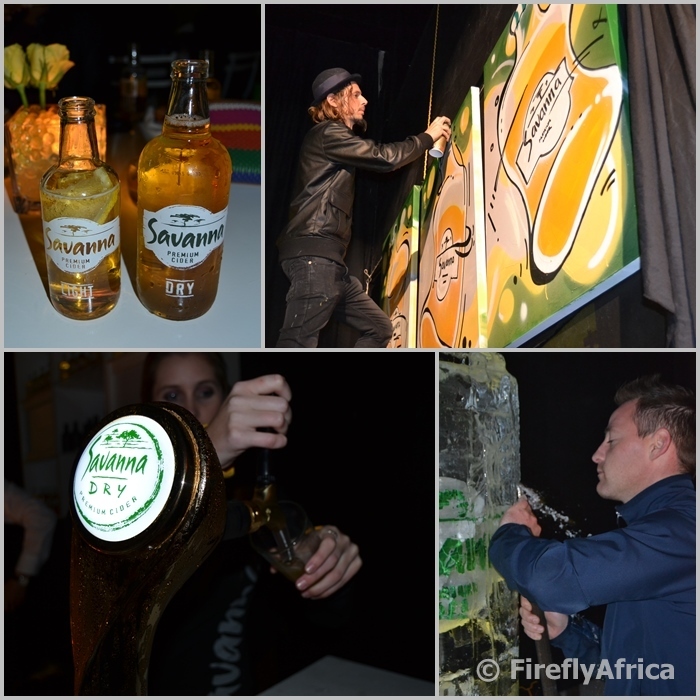 Another DJ, a graffiti artist, ice sculpture and more Savanna flowing. Even Savanna on tap... where can I get one of those? People were crowding the photo booth to have wacky group photos taken while everybody was also making the rounds to all the stations to get stickers on their competition passports. We unfortunately had to duck out just after 11 to go and relieve our babysitters so I didn't get to see who won (or if it was us). So I'm just going to end off the post with a bit of advertising spiel again - "New on the outside, still dry on the inside." Cheers, from the Damselfly and I. 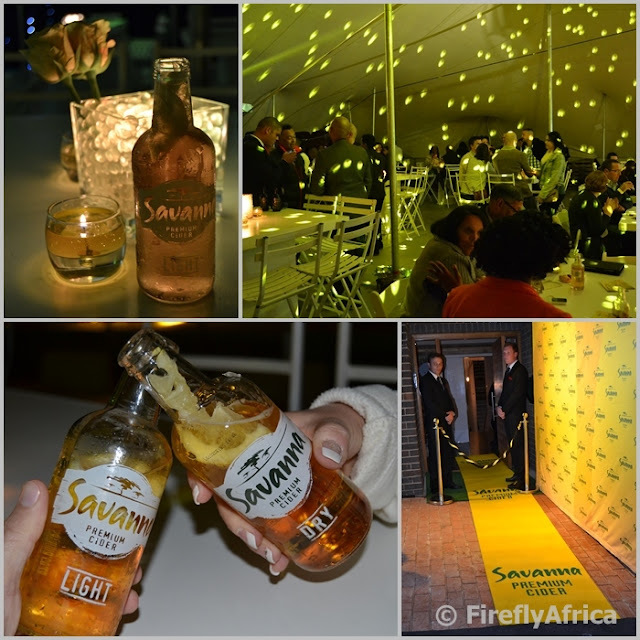 Disclosure: We attended the evening as guests of Savanna Premium Cider but I received no remuneration, wasn't asked to write a positive post and keep full editorial control. It was sad going past the Edward Hotel the other night and seeing that the whole place is dark except for the lights along the front. I wonder what's going to happen to the place or is it a case of nobody really caring at the moment? I made a quick stop in Bluewater Bay a week or so ago on my way out to Addo. 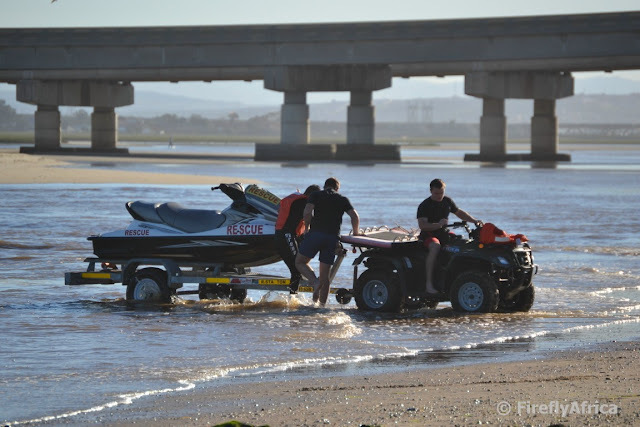 While taking a couple of photos at the Swartkops River Mouth a team from the Bluewater Bay Surf Lifesaving Club was called out to assist with an incident on the river. They quickly towed the waveski out to the water and two lifeguards set off upstream. I don't think guys like these get enough credit for what they do. 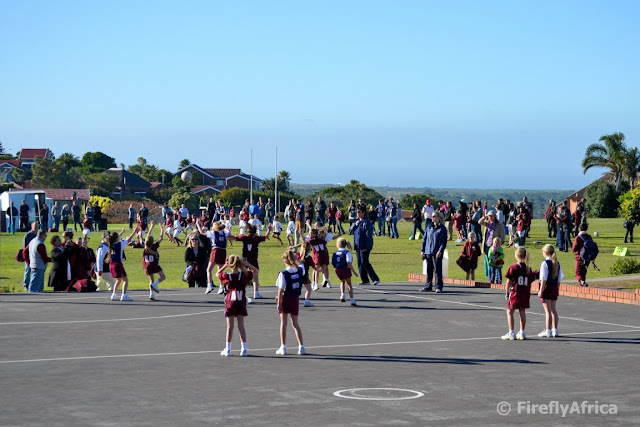 On Saturday Drama Princess played netball at the annual Newton Park Primary vs Mount Pleasant Primary inter schools sports day. This year it took place at Mount Pleasant where I went to primary school many moons ago. Now who do I support? Sorry Mount Pleasant, the KidZ are in Newton Park. I did walk around reminiscing a bit. Lots of childhood memories around the area. Sorry guys. Just realised I'm out of pictures and my camera with everything I took this week is in the boot of my car. So I will get back to Port Elizabeth tomorrow. These three are (from top to bottom) Jessie, Abigail and Cena. As much as we like to travel as a family, they don't like it when we do because they have to stay home. A couple of weeks ago we went to the Crags for the weekend. 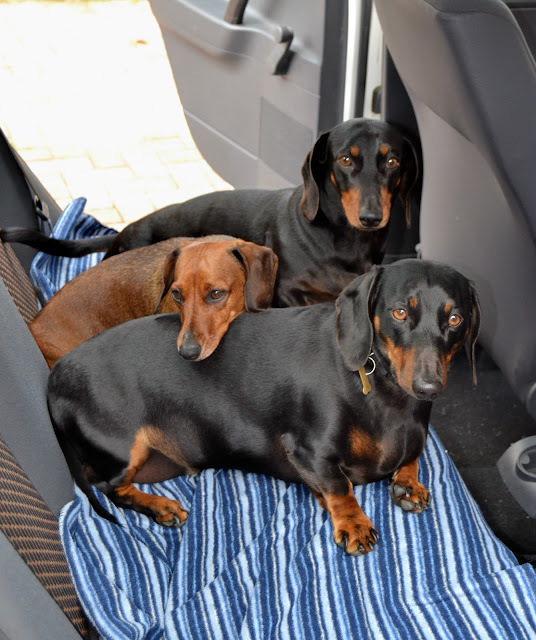 As we finished packing they hopped in the back of the car. How does one tell them to get out without feeling guilty?